I. Reality Says No, Arlon R. Tussing and Samuel A. Van VactorII. The Numbers Say Yes, Harry G. Broadman and William W. HoganIII. The Numbers Say No, Dale M. Nesbitt and Thomas Y. ChoiMany oil industry spokesmen who pleaded for a free market in the era of regulation are now urging the opposite: federal protection from low-cost imported oil. It is ironic that some economists should find merit in these arguments, particularly now that the very idea of free trade is facing the most serious assault in decades. This article presents the results of a series of exercises in the use of small-scale models to explain the spot price of crude oil. Small scale modeling-the use of a limited number of equations-involves a number of disadvantages: many interesting questions will have to be ignored and often a sense of realism may be sacrificed. However, small-scale models are an essential part of economic research. Compared to large, multi-equation models, small-scale models are often transparent-causal relations are clearly visible. In addition, small-scale models can often be easily updated and reexamined in the light of new information or assumptions. This is particularly important in policy-making when time and clear communication are at a premium. The difference between short-run and long-run flexibility in energy use is an important topic in energy demand modeling. Dynamic formulations are required to reveal this difference. The microeconomic foundation for the distinction between short- and long-run energy substitution possibilities is the embodiment of production techniques. 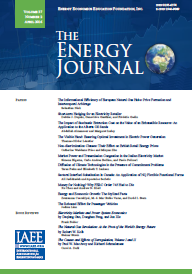 Many strategies were developed by energy-importing countries to cope with oil shocks. Some mainly adapted to the new constraints of the energy environment and tried to make up for a relative disadvantage in the energy field by obtaining a relative advantage in industry or trade. The main effect of these adaptation strategies has been to offset growing energy deficits with steadily increasing industrial surpluses. On the other hand, other strategies were adopted which aimed above all at restructuring the domestic energy system through a voluntaristic policy of promoting domestic energy supply. In these cases, investment in the energy sector was given a high priority, sometimes at the expense of other industrial sectors. The commercial and industrial sectors consume over half of the United States' electricity. Several studies have indicated that this consumption can be reduced by as much as 40 to 50 percent through cost-effective energy conservation (e.g., Dubin, 1977; Taussig, 1978). Examples of conservation actions include installation of low voltage lamps, more effective placement of lights, electronic controls for air conditioners and lights, evaporative precoolers on air conditioners and refrigerators, heat recovery systems, and so on. These actions have been found to offer, on average, exceptionally good rates of return, both to the firms that take the actions and from a social perspective (Train and Ignelzi, 1987). The sharp increase in utility rates since the 1970s has inflicted great hardship on low-income households. For many, paying their utility bills means sacrificing the purchase of other commodities essential to their economic well-being.' Another symptom of this problem is exhibited by the increased number of low-income people whose utility service has been cut off. Energy assistance programs have been instituted to cope with this serious problem. The major objectives of these programs are: (a) to make energy more affordable to the poor, thereby reducing the number of service disconnections, and (b) to limit how much the poor must pay for energy so that more funds are available for purchasing other essential commodities. Even without any energy crisis, exploiting renewable sources of energy appears more and more important to ensure the reliability of long-term supply and to provide relief now. According to the Canadian Office of Energy Research and Development, in 1985 renewable energy sources (excluding large hydro developments) contributed to yearly needs as much energy as frontier oil and gas fields combined are expected to yield by the turn of the century. This contribution was not forecast in official studies, and this failure demands that we look into the causes.